From L to R: Jane Gawronski, Dave Martin, Steve Grosch, Steve Haynes, and Paris Barrowclough. 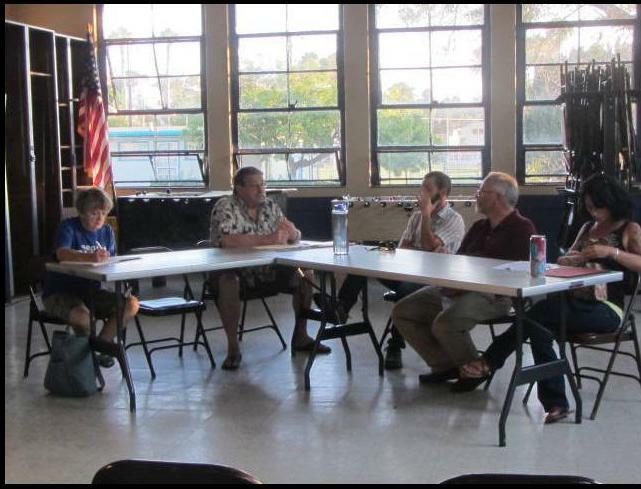 The following is a report on the most recent meeting of the OB Community Development Corporation (held on Wednesday, August 13). and the Children’s Play Area/Adult Fitness area. Bricks and tiles are currently for sale to be placed on the OB Entryway wall for $200 and $1000 respectively; additional information was requested on the details and arrangements with the city to place them on city property and will be provided when it is available. The Veterans Plaza application for a Process 3 Coastal Development Permit is proceeding smoothly, and is expected to be granted within two to four months. The two visitors at the meeting were there to inquire about getting family member names on the wall and the process of turning in the application. Also proceeding smoothly is the change of name for a portion of Ocean Beach Park, sometimes called Saratoga Park or Saratoga Beach Park, to the Ruth Varney Held Park. Lori Zapf’s Council Representative announced there were no problems with going forward. The OB Historical Society Board has voted to allocate $1300 to this OB CDC Project, contingent on the naming of the park for Mrs. Held. Board members present were Jane Gawronski, Dave Martin, Steve Haynes, Steve Grosch, and Paris Barrowclough.